Now - do you want to know what it is? Well, if you're like some businesses, you probably started marketing with a brochure. And your brochure probably has the usual information in it: logo, services list, benefits, and features of your product, a short biography. client list and contact information. Secondly, if you're in business these days, you have to have a website. But, do your website and brochure match? There is a seven touch rule in sales and marketing that says you have to touch a prospect at least 7 times before they buy from you, and in the information age it is becoming a ten touch rule. Almost as important as the number of touches is the consistency of your message. If your website and your brochure do not have a consistent message, then your prospect becomes confused, and the confused mind always says NO!!! The WEB-BRO-COMBOSM eliminates the problem of inconsistent message. When you do business with Jay Williams Design Company, your WEB-BRO-COMBOSM is maintained by the design chameleon, Jay Williams. 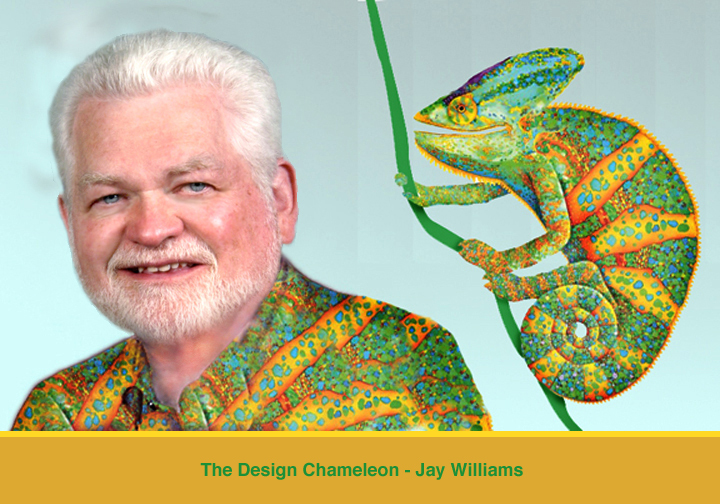 And like a chameleon changes its color to adapt to its environment, whether you want to match an illustration style or your materials must adapt to a changing market and client demands, Jay Williams can make those changes quickly and seamless. To help your clients and prospects to remember your business we use our design specialty, the collage. Most of the memories we retain are visual. By employing the collage approach we can give your prospects several visuals of your business. When the mind sees several images it increases the chance that one will be remembered and one memory is all you need for them to call you. Jay Williams Design Company - images your clients remember, 24 hour service from the design chameleon, and because the confused mind always says no, a consistent message using the what? ..................The WEB-BRO-COMBOSM. Around the Ever Growing Internet. and by Anyone Representing You. the Look and Feel of Your Web Site. You Want People to Experience "Deja Vu"